Right-click where you want to place your signature. Choose 'Signature' from the menu. Select 'My signature' to add an existing signature. Select 'Customer signature' to create a new signature from the keyboard, trackpad or image. Drag and drop it into your document. Not so long ago, when you received an email with a contract, you had to print it, sign with a pen, scan the signed document and send it back. That takes too much time, paper and ink. This is why electronic signature space grew so much recently (think of DocuSign, EcoSign, etc). While these services are good, they might be a little be too specific and narrow in terms of what they allow you to do, namely, sign the contracts people send you. If you're a proud MacBook user and wondering how to sign a PDF document on Mac, PDF Expert provides the best signing experience on the platform. Say, you want to annotate a contract or add a few notes before actually signing it, download PDF Expert and you'll be able to make all those changes from the box and negotiate better terms. Keyboard: Type your name on the keyboard and PDF Expert will transform it into beautiful handwriting. Trackpad: Use your MacBook's trackpad and draw it with your finger or stylus. Standard image from your desktop: Upload any image and apply it as your signature to the document. iOS integration. PDF Expert has the same storage for both platforms. You can create a beautiful signature with Apple Pencil on your iPad and then you can use it to sign a PDF on Mac. Electronic signature fields recognition. 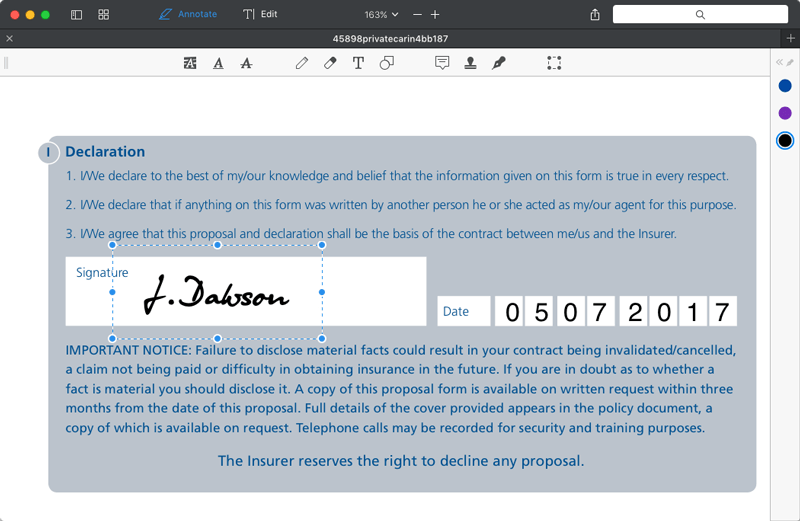 PDF Expert easily finds the special signature fields in your PDF. It saves your time by automatically adjusting each signature size to fit the field. Download a free trial or buy PDF Expert from our website. Open the document that needs to be signed (simple invoice template for example). Right-click where you want to place a signature. Choose "Signature" from the context menu. Click "My Signature" to choose one of your existing signatures or create a new one. Your signature will appear exactly where you clicked, and you will be able to move and edit it as you wish. Magic! Great signing tools together with the powerful editing features and elegant design make PDF Expert the best solution for all your PDF needs. If you're struggling with how to sign a PDF document on Mac, PDF Expert must be your tool of choice.